The Vernal Equinox arrived at 2:58 pm (PDT) on March 20. The winter constellations are sinking into the west as the ones for spring are rising in the east. Spring constellations seem to lack the intensity of the winter ones but here are a few to keep in mind. First off is Ursa Major which contains the more familiar asterism “The Big Dipper” (both not in the illustration). The Big Dipper is a familiar site to northern observers and offers several pointers to interesting objects. The two starts of the dipper point to Polaris the North Star. Just below the last star in the handle is M51, the brilliant Whirlpool Galaxy which is actually in the constellation Canes Venatici. Finally in the handle, a test of eyesight, the middle “star” actually consists of two stars: Alcor and Mizar both are multiple star systems themselves. The Big Dipper, the handle’s curve suggests a great path to several bright Spring stars. Following the handle’s arc, the first bright star is Arcturus in Boötes followed by Spica in Virgo. 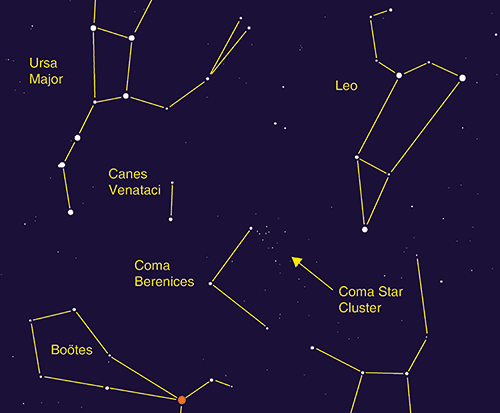 Leo is probably one of the more familiar spring constellations. Leo is made up of a triangular grouping of stars for the lion’s hind quarters while the lion’s head and mane are represented by the backwards question mark. The bright star Regulus marks the “period” in the question mark. Hydra is one of the fainter constellation but is actually the largest. Look for the serpent’s circular head in the west, just ahead of Leo, and the body winding its way down and to the east until it stops just under Spica. There are 110 astronomical objects cataloged by Charles Messier. In spring particularly at the end of March, northern hemisphere observers are in the position to attempt to obverse all 110 Messier objects in one night. The Messier Marathon, is possible only at this time when the sun is positioned such that it is not obscuring any objects. Go about and try to find as many M numbers as you can. I personally like M104, the Sombrero Galaxy, a challenging object to spot from a suburban backyard. Mercury is in the morning sky with greatest western elongation on April 11 but it is still only 5° from the Sun making it nearly impossible to observe. Venus is still in the morning sky rising about 1 hour before sunrise. Mars is still in the evening sky but is sinking into the western twilight. Jupiter starts spring a morning planet through it rises very late at night. On June 10, Jupiter will be at opposition in the constellation Ophiuchus and visible all night. Saturn is in Sagittarius and visible in the late night / early morning. Uranus is too close the Sun to observe. Neptune is a morning planet in the constellation Aquarius.